Stop and mend hair breakage and repair split ends with this intense hydrating treatment. Cantu Shea Butter Leave-In Conditioning Repair Cream is an award-winning product that uses pure shea butter and other natural oils to stop and mend breakage, repair split ends, and add manageability each time it is used. 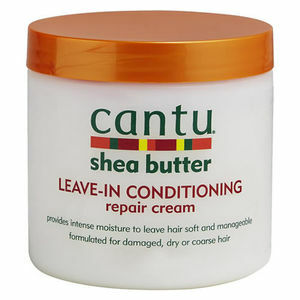 Shea Butter is brilliant at treating dry, itchy scalps and dandruff. Use it on a daily basis to help promote stronger, healthier hair. It's been specially formulated for damaged, dry or coarse hair and to reduce frizz but also works brilliantly for relaxed, texturised, coloured and permed hair.